The top two teams in the California Winter League, both riding winning streaks, saw action at Palm Springs Stadium while the other teams around the league were trying to keep pace on the final day of January. 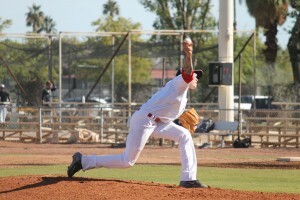 The early game at the Palm Springs Auxiliary Field matched up the Palm Springs Chill (7–2) and the Alberta Grizzly (2–8). Scoreless through the first two, the Chill offense would break through with four in the top of the third. Quintin Alexander ripped a two-run double in the inning. With Johnny Melero on the mound, that would be all the Chill would need as Melero went four strong innings, striking out just one, but inducing a lot of weak contact and did not allow a free pass as he earned the win. 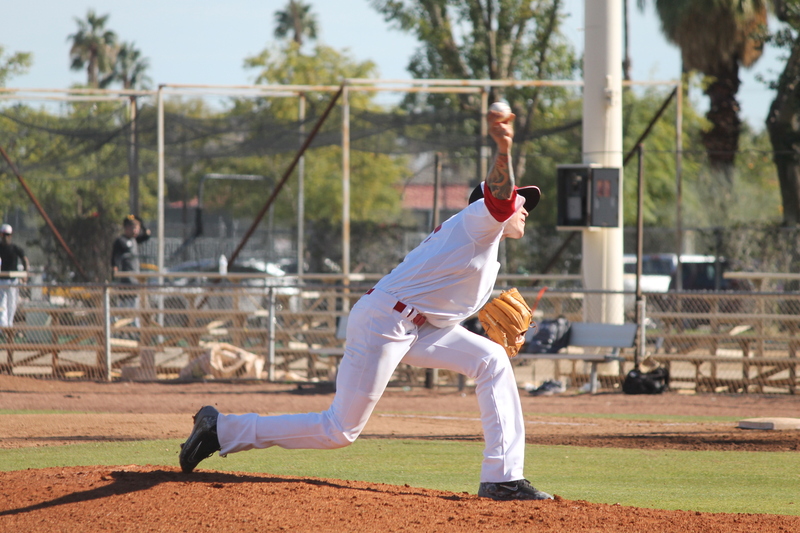 Tyler Eichhorst earned the save as he struck out four in the final three innings, allowing just one run as Palm Springs clinches this one with a final score of 7-1. Over at Palm Springs Stadium, it was the British Columbia Bombers (4–4) taking on the red-hot Toronto Rush (7–3), winners of a league-high six straight. The Bombers scored four in the top of the first thanks to a single by Thomas McGuckin and an error by the left-fielder that scored three. The Rush would claw back, getting to within 5-4 heading into the top of the seventh, with a two-run home run by Nate Ferrell being the big hit in Toronto’s comeback attempt. McGuckin then came to bat with two outs and hit a line drive missile that cleared the wall, giving the Bombers a three-run cushion and the Rush would be unable to mount another rally. 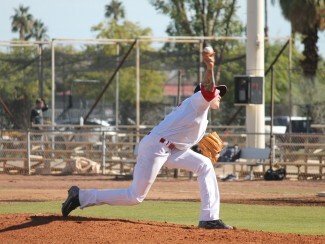 Mark Burnside earned the victory as he shutout the Rush through four innings. Devin Alexander earned the save with a scoreless seventh to end Toronto’s winning streak. Meanwhile Hit King (4–4–1) faced off against the New York Colonials (6–3–1) in the mid-morning matchup over at the Auxiliary Field in a game that only went six innings. Jimmy Pinakidis hit a two-run shot in the top half of the first and Hit King took an early 3-0 lead. New York’s Bud Morton cut into the lead with an RBI ground out after Giovann Texiera tripled with one out in the bottom of the third. Both offenses were kept in check until the bottom of the sixth when the Colonials scored one on Mark Demko’s RBI ground out, making the score 3-2. With two outs, and two runners on, Jared Ensmenger delivered with a clutch base hit to tie the game at three. This game would end in a 3-3 tie after six innings and no pitcher was credited a win. In the second and final game at the main field the Canada A’s met up against the CWL’s top team, the Palm Springs Power. The Palm Springs bats came alive in this one as they would score in the final five innings, including a five-run outburst in the top of the fifth. Marty Windisch, who finished the day a home run shy of the cycle, had the big hit, a bases clearing triple to give his team a 9-0 lead. The big story in this game, however, was not the offense, but the Power pitchers. Lobdell kept the powerful A’s off the board as he no-hit them through four innings and struck out four as he earned the win in the game. Relievers Cody Beck and Tanner Kiest would combine for three innings, allowing no runs, and most importantly, no hits, as the Power combined to throw a no-hitter. It would be the Power all over the A’s as they win 13-0 and extend their winning streak to five. The final game of the day pitted the Manitoba North Stars (2–8) against the Oregon Lumberjacks (6–4). Manitoba would explode for six runs in the second inning as they got a single from Dylan Sprague that scored two and also got a two-out, two-RBI double from Blair Beck. Lumberjack pitchers would do well to keep the North Stars off the board in all other innings, but with Joseph Webb on his A-game, the could never work themselves back into it on offense. Webb struck out six, allowing just one run and containing Oregon to three hits and allowed only one base on balls. Webb got win as his team comes out on top with a final score of 6-1. Click here for today’s box scores. With tomorrow being Wednesday, it will be $1 admission day brought to you by Jack in the Box. All fans get in the gates for just $1!